Yo, ho, ho, and a bottle of rum! It’s me again yer favorite app pirate ready for another adventure with the crew, and ‘ofcourse me favorite parrot pet. We are set to sail the seven seas again on the search of the greatest treasures. But don’t ye worry me hearties, I didn’t forget yer regular dose of app review. ‘Afore we start sailing, let me tell ye about this app called Cooking Mama from Office Create Corp. The graphics of this game is adorable. Even for those who are not into cooking games, they will still find the images adorable. From the main character, which is the cooking mama, to the various recipes that you need to prepare, the attention to detail is great, and the colors are pleasing to the eyes. 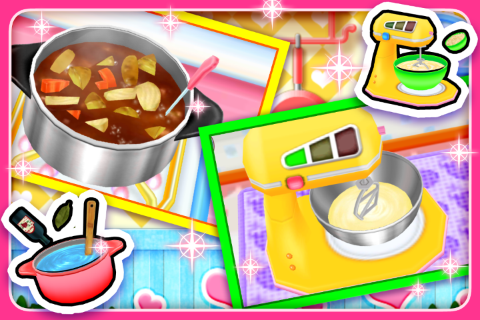 They may not look as realistic as other cooking games, but since you will be doing each step to prepare a dish, it will still feel like you are really cooking, which is a positive experience, especially to those who wish to learn or who enjoy cooking. There are many recipes available in the game. While it is nice to have more dishes to cook, there are only a few that comes with the game for free. Most of them must be purchased using real money and the cost per package is not cheap. If you are only looking for a game to past time and don’t want to spend any money, you can continue playing but only with limited dishes. The food packages are high in price. Like most free to download apps, Cooking Mama also has advertisements. However, the pop-ups in this game are intrusive so they affect the overall gaming experience. Everything that you make will be rated with a maximum of three stars. This is unnecessary as it delays the game. It would have been better if the star rating is done after completing the dishes. There’s added fun in this app as it is not just all about cooking as there are several mini games that you can play if you want to try other ones aside from dish cooking. Cooking Mama has amazing graphics. This is one of the things that would immediately catch your attention. The images are detailed, and you will do the cooking step by step like you are doing the real thing. There are also added mini games that will keep you occupied in case you got bored playing the actual cooking game or you just want to play something new. While there are several dishes to make, only a few of them are available for free. Most of them must be purchased using real money and the rate is not cheap. The advertisements are also intrusive, as they just pop-up out of nowhere. Cooking Mama is generally a nice and entertaining game to play. 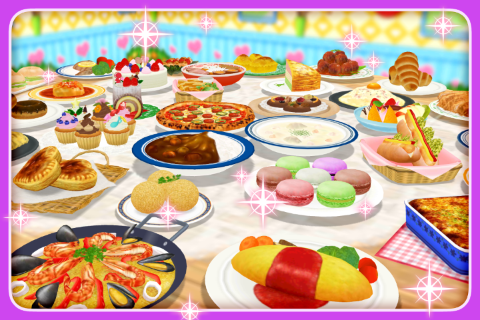 Most of the recipes might be available for purchase using real money, but you can still continue playing without spending anything, although the recipes are only limited. The mini-games also adds variation.